It’s been a hectic spring with a lot of travel to the Elite series tournaments and promotion events, so the Memorial Weekend holiday was dearly needed time off. So, with a good weather forecast, the family hitched up our RV and Nitro Z-19 and headed to Muskegon Lake to meet up with some friends of the family. 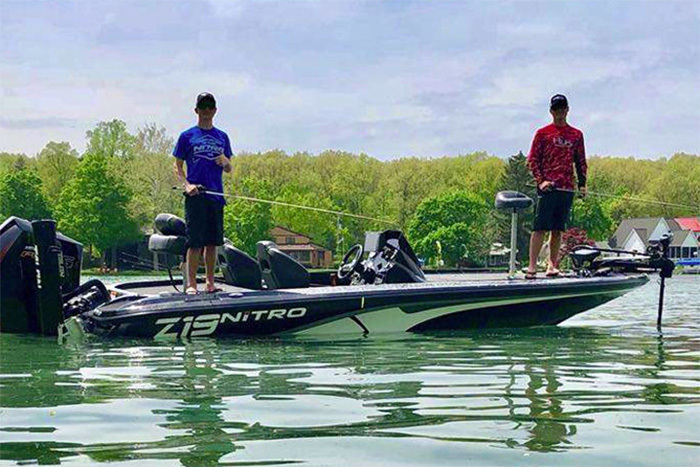 The Z-19, fitted with the new Mercury Pro XS four-stroke, arrived while I was at Lake Travis so I hadn’t had a chance to run it, but Jackson and Nicholas put it to the tests. Anyway, while we were up there, the boys heard about an open team tournament on Muskegon and wanted to fish it. Some of their college friends were fishing the event with their dads. My challenge was I have two boys who are on the Grand Valley State college bass team and love to fish, and I didn’t want to have to choose one over the other. Jackson graciously recommended I fish Muskegon with Nicholas, and I will fish some weeknights this summer with him. It’s been several years since I’ve fished any local tournaments other than the occasional weeknight, so this was a real eye-opening experience. It also brought me back to my roots when I was a young angler fishing Muskegon and some of the other great bass lakes in Michigan. 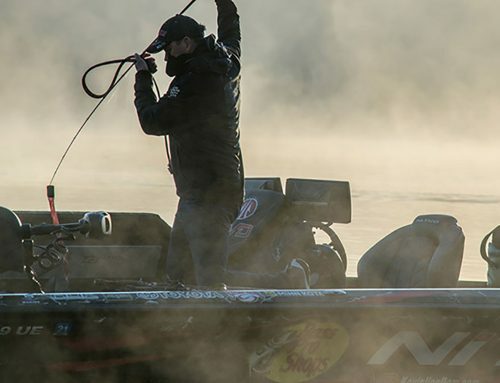 There were 75 boats comprising of several college kids at the tournament, some of whom were fishing with their dads, and several anglers I’ve met at sport shows but have never competed with in a local event. The fishing was great. Nick and I probably caught 100 bass and 40 keepers, and although we didn’t get in the money, we weighed in 15 pounds and we had a blast. It made me realize again how much fun fishing locally can be. I was amazed and how everyone has the latest in-boat equipment, even on older boats. 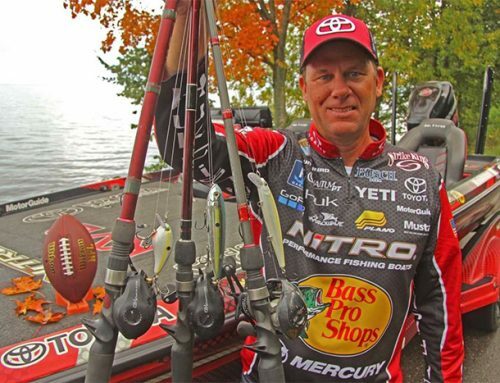 Some had 20-year-old bass boats with Minn Kota Ultrex trolling motors, shallow water anchoring systems and the latest in electronics. Furthermore, I was surprised by the number of young college anglers and how many had wrapped boats. It’s equally amazing how the tournament attire has changed at that level. 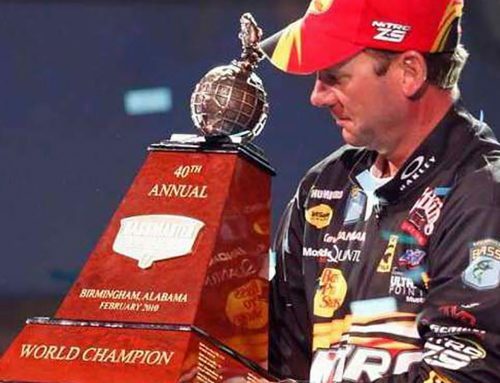 When I fished locally, nobody had fishing-related clothing, but at this event several wore jerseys, Huk Performance Gear, buffs and sponsor hats. And the fishing was great. Nick and I probably caught 100 bass and 40 keepers, and although we didn’t get in the money, we weighed in 15 pounds and we had a blast. It made me realize again how much fun fishing locally can be. Nick drove the boat, and we worked as a team. On his first cast, he had a big bass explode on a KVD Splash. He had it coming to the boat and it came off, and he was immediately disappointed. I pointed out he did nothing wrong, that the bass were in postspawn and that’s part of tournament fishing. He made up for it later in the day by catching our biggest bass of about 4 pounds. It was a great learning experience for him. Like me, he’s a power fisherman, but the lake was dead calm and, with the fish in post-spawn, we had to slow down. We caught bass on a variety of techniques, but most of came on a Texas-rigged Ocho that we pitched in and over weed beds in 5 to 10 feet of water. He had never done that before so he got to see how effective it can be during this time of year. It was so much fun competing at this level again and to do it with one of my sons made it even more special. I can’t wait to get back out there with Jackson and enjoy an equally fun experience.